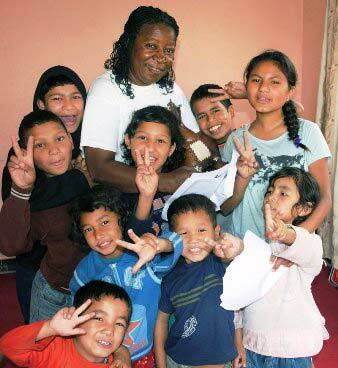 Mereline Brown, a nurse in Florida; volunteered at a hospital in Uganda, and then in a children's home in Nepal. Volunteering can be a life-changer, and Mereline Brown is the perfect example. She went to Uganda with ELI, then returned a year later, this time to work with ELI’s Nepal program. Uganda proved a fulfilling and productive experience, but it was Nepal that absolutely captured Mereline’s heart. Today, volunteering and fundraising for a Kathmandu orphanage are the central facts of Mereline’s everyday life. Mereline’s first impression was of great need. The moms and babies were very poor, the care was, by western standards minimal, and the hospital suffered from great shortages. “There was no pain medication for the moms, shortages of IV supplies, gloves – the kind of things I call basics.” Mereline donated supplies she’d brought with her, including baby clothes and blankets, and set to work at the hospital. “I saw a lot of interesting cases,” she recalls, but she focused on offering care and expertise in the delivery room and beyond. In her off hours, she visited a school in deeply remote Uganda, and shared insights with her friend, who worked with children stricken with malaria. When she returned home, Mereline knew her work wasn’t over. She approached friends, co-workers and neighbors for donations and materials, and the result was four large boxes of medical supplies and children’s clothes which Mereline mailed to Africa at her own expense. We know how it happened: Mereline’s energy is infectious and inspiring. Anish and Pratik are now close friends with whom she stays in frequent contact, and who provide her with regular updates on the orphans’ welfare. In her “free” time, Mereline focuses sets up what she modestly calls “little projects” to continue the flow of help from this generous woman to the needy children of Kathmandu. With donated items from friends and family, she organizes garage sales and sends the proceeds to Nepal. Last year, all the children at the orphanage got warm socks and winter jackets when she wired $200 the garage sales brought in. But that’s just the beginning. Mereline collects items through her church and through her wide circle of friends. She approached the company she works for to donate medical equipment and supplies; when friends buy new laptops she asks for the old ones, to be used as teaching tools for the orphanage children. When she hears someone is flying to Nepal, Mereline persuades them to take an extra suitcase filled with gifts for the orphanage. She has a non-profit business license and is working on an import/export license to ease the shipping of supplies to Kathmandu. She’s making plans to teach Nepalese women to crochet, to offer adult hygiene classes and computer classes based at the volunteer house. What’s next for this amazing volunteer? Another trip to Kathmandu, of course. The February airfare tickets are booked, Anish and Pratik are on standby and the orphanage children are eagerly awaiting as Mereline brings supplies, donations and her own indomitable spirit to this lovely, exotic but needy part of the world. More information on ELI's Uganda Programs. More information on ELI's Nepal Programs.